Barely a month after Nvidia's last GF100 graphics card, the GTX 465, struggled out the stable door another new graphics card, the GTX 460, has turned up to steal its thunder. This time round though we're not just talking about another cut-down Fermi card based on the once-proud GF100 GPU. Oh no, now we're talking about an all new and improved GPU with the relevant architecture poked and prodded into a more streamlined shape. The first card to utilise this GF104 GPU then is the GTX 460 in its various shapes and memory sizes. There are essentially two basic spins of the card; one with a full 1GB of GDDR5 and another with a slightly more limiting 768MB of the same GDDR5. There are other differences linked in to the difference memory capacities too, namely a 256-bit and a 192-bit memory bus as well as a rather chopped-down ROPs count for the lower memory card. You've also got less of the L2 cache that sits in between the GPU's streaming multiprocessors doing the collating. Zotac's 1GB version of its GTX 460 carries a slightly different cooler to the reference design favoured by both EVGA's GTX 460 768MB standard and Superclocked versions of its 768MB cards. It's more in line with the reference cooler seen on the GTX 470 and GTX 465 cards. Though compared with the GTX 465 cooler it does have a much larger, hence more efficient, fan. Where the GTX 465 was priced head-to-head with AMD's comparatively-priced Radeon HD 5850, the GTX 460 is hitting a pricepoint which undercuts its immediate Radeon-shaped competition by a fair margin. In performance terms though the HD 5850 and GTX 465 traded blows quite happily, and on average the Nvidia card came out on top, especially when its overclocking headroom came into play. The GTX 465 was also rather close to GTX 470 performance when judicious use of the overclock stick was applied to it, and that's damned impressive for a £230 card up against a £280 one. 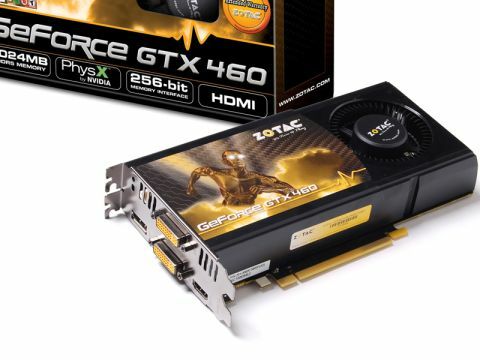 Unfortunately, the GTX 470 being priced at only £50 more than a GTX 465 running at the top of its game made the pricier card a far more attractive offering still considering the extra headroom inside it. The GTX 465, then, really only faced competition from within Nvidia. And that competition is only going to get worse with the cheaper, and in some cases faster, GTX 460 now hitting the shelves – especially this 1GB edition from Zotac.